The air campaign that opened the Gulf War in January 1991 was one of the most stunning in history. For five weeks, American and other Coalition aircraft pounded enemy targets with 88,000 tons of bombs. Sorties—more than 100,000 of them—were launched from bases in Saudi Arabia, from aircraft carriers in the Persian Gulf and Red Sea, and even from bases in the United States. The skies over Iraq and Kuwait were filled with a dizzying array of new and improved weapons—Tomahawk and Hellfire missiles, stealth aircraft, and laser-guided smart bombs—and the results were impressive. The Coalition swiftly established air superiority and laid the foundation for the successful five-day ground campaign that followed. The results were also highly visible as the American people watched the bombings unfold in grainy green video-game-like footage broadcast on CNN and the nightly news. 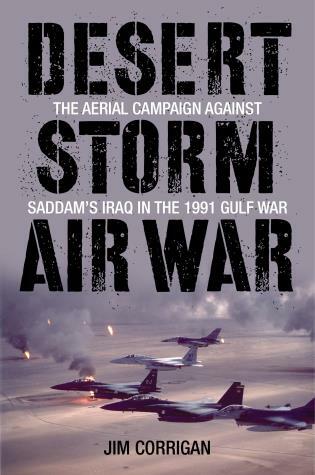 The overwhelming success of the Desert Storm air campaign has made it influential ever since, from the “shock and awe” bombing during the Iraq War in 2003 to more recent drone operations, but the apparent ease with which the campaign was won has masked the difficulty—and the true achievement—of executing such a vast and complex operation. Using government reports, scholarly studies, and original interviews, Jim Corrigan reconstructs events through the eyes of not only the strategists who planned it, but also the pilots who flew the missions. Jim Corrigan holds degrees from Penn State and Johns Hopkins. He has written for American History magazine among other publications and is the author of The 48th Pennsylvania in the Battle of the Crater (McFarland, 2006) and more than a dozen books on military history topics. He appeared on PCN’s PA Books. He lives near Harrisburg, Pennsylvania.